Our Group is dedicated to continuing the training traditions of Lieutenant Pete Lund, a 30 year veteran of FDNY assigned to Rescue Company 2. During Pete's three decades of fire duty, he became known as "Vulcan" the Greek God of Fire. In 2002, he formed a group of firefighters to go out and provide realistic fire training across the country. Although comprised mainly of FDNY members, most had a background in the volunteer fire service. In 2005, Pete died in the line of duty while operating at a structure fire in his hometown of Woodmere, NY. Although Pete is no longer physically with us,"his guys" continue his mission of keeping the training interesting and informational. We pride ourselves on Pete's theory: "In The Fire Service You Either Lead, Follow, Or Get Out Of The Way"
We pride ourselves on the fact we are a "senior" teaching crew. The Instructors all have 20+ years of experience in the fire service. What seperates PL Vulcan Instructors from the pack? Our programs are "experienced based". The average instructor is a 20 plus year veteran of the Fire Service that will work with you, NOT TALK DOWN TO YOU... We are comprised of talented instructors from all walks of life. 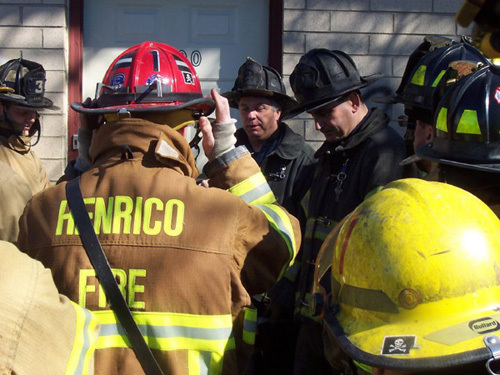 Our company is comprised of instructors from fire departments from across the country and not just the FDNY....Paid,volunteer, urban and rural; that is PL Vulcan Fire Training.